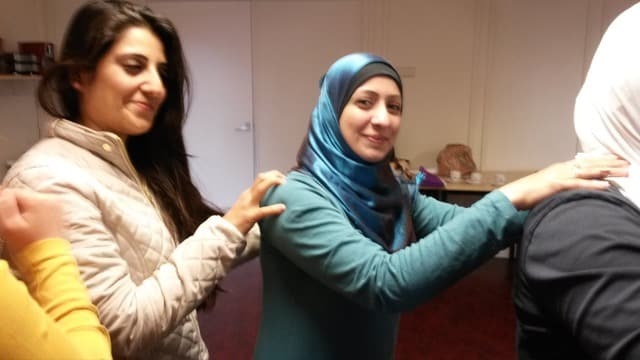 Sixteen Syrian women acquired a plethora of new techniques to make stress disappear from their bodies and to feel more comfortable in their skin. Hanne Verhoeven gave 4 workshops of two hours each. Two case managers ‘Inburgering en Werk’ (Integration and Labour) from the municipality of Lingewaard were looking for a different approach to achieve more progress with their language and integration courses for refugees with a residence permit. They are suspecting that stress due to war and fleeing is the reason why integration is slower than would be expected based on level of education. Want to know more about the content and approach used in this workshop?